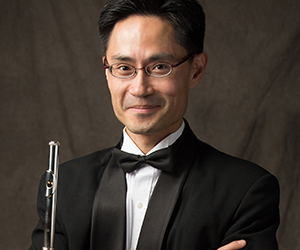 One of the most versatile flautists in Ontario, Stephen Tam is equally comfortable as soloist, chamber musician or orchestral player, performing repertoire ranging from the baroque to the contemporary. Stephen was the First-Prize Winner of the 32nd CBC/Radio-Canada National Competition for Young Performers. His past concerto engagements include appearances with the Calgary Philharmonic, the Banff Festival Orchestra and the Canadian Sinfonietta. His performances have been broadcast on multiple occasions nationwide on CBC Radio. As chamber musician, Stephen has performed at The White House, the Ottawa International Chamber Music Festival and the Hong Kong Government House. He is a founding member of the woodwind quintet, the Sinfonietta Winds. Highly regarded as interpreter of contemporary music, Stephen is a frequent guest of Contact Contemporary Music, New Music Concerts, Toca Loca, the Toronto New Music Projects and 5-Penny New Music Concerts (Sudbury). Stephen is currently the principal flute of the Canadian Sinfonietta, and regularly serves as principal flute with many orchestras and choral groups around Ontario, including the Toronto Mozart Players, Pax Christi Chorale and Cantores Celestes. In the past, he has performed with the Cleveland Orchestra, the Kitchener-Waterloo Symphony and the Ontario Philharmonic. A dedicated and highly-respected teacher, Stephen is a flute faculty member at both the University of Toronto’s Faculty of Music and at Western University’s Don Wright Faculty of Music. He also maintains a private studio in Thornhill, Ontario. Stephen received his Master of Music in Orchestral Performance degree and the Professional Studies Certificate from the Manhattan School of Music, where he was a student of Jeanne Baxtresser and Michael Parloff. He also studied with Douglas Stewart at the University of Toronto’s Faculty of Music, where he obtained his Bachelor of Music in Performance with Honours.